277 pages | 25 B/W Illus. 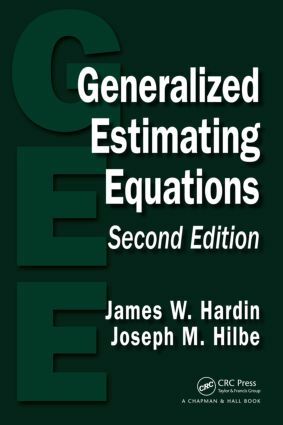 Generalized Estimating Equations, Second Edition updates the best-selling previous edition, which has been the standard text on the subject since it was published a decade ago. Combining theory and application, the text provides readers with a comprehensive discussion of GEE and related models. Numerous examples are employed throughout the text, along with the software code used to create, run, and evaluate the models being examined. Stata is used as the primary software for running and displaying modeling output; associated R code is also given to allow R users to replicate Stata examples. Specific examples of SAS usage are provided in the final chapter as well as on the book’s website. This second edition incorporates comments and suggestions from a variety of sources, including the Statistics.com course on longitudinal and panel models taught by the authors. Other enhancements include an examination of GEE marginal effects; a more thorough presentation of hypothesis testing and diagnostics, covering competing hierarchical models; and a more detailed examination of previously discussed subjects. Along with doubling the number of end-of-chapter exercises, this edition expands discussion of various models associated with GEE, such as penalized GEE, cumulative and multinomial GEE, survey GEE, and quasi-least squares regression. It also offers a thoroughly new presentation of model selection procedures, including the introduction of an extension to the QIC measure that is applicable for choosing among working correlation structures. See Professor Hilbe discuss the book. "Overall, I found this to be a very useful book on GEE, and would recommend it to anyone planning to use GEE models in their data analysis. Both the theory and practical aspects of constructing and analysing such models is covered. Inclusion of code for many of the analyses is an excellent feature." " … the authors expand the text with several additions: (I) they examine and include entirely new topics related to GEE and the estimation of clustered and longitudinal models; (2) they add more detailed discussions of previously presented topics, including expanding the discussion of various models associated with GEE (penalized GEE, survey GEE, and quasi-least-square regression), adding material on hypothesis testing and diagnostics, and introducing alternative models for ordered categorical outcomes and an extension of the QIC, which is a model selection criterion measure; (3) they expand the amount of computer code by adding R code to duplicate the Stata examples wherever possible. In my opinion, the second edition is enhanced by the additions mentioned above, providing an excellent review of the GEE, wide coverage of its variations, and many useful computing techniques. I believe it would be a very useful reference book for practicing researchers and graduate students who are interested in research topics related to GEE." "The second edition … adds a few new topics related to various extensions of GEE … [and replaces] outdated S-PLUS codes with R scripts. Also, the number of exercises increased significantly … . For those who want to use this book in the classroom, including me, having extra exercise sets is certainly a welcome addition. … One main strength of this book is its comprehensive coverage of Stata implementation of the GEE. … a valuable reference and is particularly useful for practitioners. It can serve as supplemental reading in longitudinal data analysis classes as well." "… well-written chapters … . The book contains challenging problems in exercises and is suitable to be a textbook in a graduate-level course on estimating functions. The references are up-to-date and exhaustive. … I enjoyed reading [this book] and recommend [it] very highly to the statistical community." "[The book] is comprehensive and covers much useful material with formulas presented in detail … a useful and recommendable book both for those who already work with GEE methods and for newcomers to the field." "Generalized Estimating Equations is the first and only book to date dedicated exclusively to generalized estimating equations (GEE). I find it to be a good reference text for anyone using generalized linear models (GLIM). The authors do a good job of not only presenting the general theory of GEE models, but also giving explicit examples of various correlation structures, link functions and a comparison between population-averaged and subject-specific models. Furthermore, there are sections on the analysis of residuals, deletion diagnostics, goodness-of-fit criteria, and hypothesis testing. Good data-driven examples that give comparisons between different GEE models are provided throughout the book. Perhaps the greatest strength of this book is its completeness. It is a thorough compendium of information from the GEE literature. Overall, Generalized Estimating Equations contains a unique survey of GEE models in an attempt to unify notation and provide the most in-depth treatment of GEEs. I believe that it serves as a valuable reference for researchers, teachers, and students who study and practice GLIM methodology." "Generalized Estimating Equations is a good introductory book for analysing continuous and discrete data using GEE methods … . This book is easy to read, and it assumes that the reader has some background in GLM. Many examples are drawn from biomedical studies and survey studies, and so it provides good guidance for analysing correlated data in these and other areas." James W. Hardin is the Division Director of Biostatistics and an associate professor in the Department of Epidemiology and Biostatistics at the University of South Carolina. He is also an affiliated faculty in the Institute for Families in Society. Professor Hardin was the initial author of Stata’s xtgee command and has authored numerous articles and software applications related to GEE and associated models. Professor Hilbe and he have authored three editions of the popular Generalized Linear Models and Extensions and co-authored Stata’s current glm command. He has also co-authored (with P. Good) four editions of the well-accepted Common Errors in Statistics (and How to Avoid Them). Joseph M. Hilbe is a Solar System Ambassador with the Jet Propulsion Laboratory, an adjunct professor of statistics at Arizona State University, and an Emeritus Professor at the University of Hawaii. An elected fellow of the American Statistical Association and elected member of the International Statistical Institute (ISI), Professor Hilbe is president of the International Astrostatistics Association as well as chair of the ISI Sports Statistics and Astrostatistics committees. He has authored two editions of the bestseller Negative Binomial Regression, Logistic Regression Models, and Astrostatistical Challenges for the New Astronomy. He has also co-authored Methods of Statistical Model Estimation (with A. Robinson), Quasi-Least Squares Regression (with J. Shults), and R for Stata Users (with R. Muenchen).